To which the chief of his own priests, Coifi, immediately answered: "O king, consider what this is which is now preached to us; for I verily declare to you that the religion which we have hitherto professed has, as afar as I can learn, no virtue in it. For none of you people has applied himself more diligently to the worship of our gods than I; and yet there are many who receive greater favors from you, and are more preferred than I, and who are more prosperous in all their undertakings. Now if the gods were good for anything, they would rather forward me, who have been more careful to serve them. If follows, therefore, that if upon examination you find those new doctrines which are now preached to us better and more efficacious, we should immediately receive them without any delay." Another of the king's chief men, approving of Coifi's words and exhortations, presently added: "The present life of man, O king, seems to me, in comparison with that time which is unknown to us, like to the swift flight of a sparrow through the room wherein you sit at supper in winter amid your officers and ministers, with a good fire in the midst, whilst the storms of rain and snow prevail abroad; the sparrow, I say, flying at one door and immediately out at another, whilst he is within is safe from the wintry storm; but after a short space of fair weather he immediately vanishes out of your sight into the dark winter from which he has emerged. So this life of man appears for a short space, but of what went before of what is to follow we are utterly ignorant. If, therefore, this new doctrine contains something more certain, it seems justly to deserve to be followed." The other elders, and king's counselors, by divine inspiration, spoke to the same effect. But Coifi added that he wished more attentively to hear Paulinus discourse concerning the God whom he preached. So the bishop having spoken by the king's command at greater length, Coifi, hearing his words, cried out: "I have long since been sensible that there was nothing in that which we worshipped, because the more diligently I sought after truth in that worship, the less I found it. But now I freely confess that such evident truth appears in this preaching as can confer on us the gifts of life, of salvation, and of eternal happiness. For which reason I advise, O king, that we instantly abjure and set fire to those temples and altars which we have consecrated without reaping any benefits from them." In October 1717, Dom Pedro de Almedida, Count of Assumar passed through the area of Guarantinqueta, a small city in the Paraiba river valley. The people there decided to hold a feast in his honour, and though it was not fishing season, the men went to the waters to fish for the feast. Three of the fishermen, Domingos Garcia, Joco Alves, and Felipe Pedroso, prayed to the Immaculate Conception, and asked God's help. However, after several hours they were ready to give up. Joco cast his net once more near the Port of Itaguagu, but instead of fish, he hauled in the body of a statue. The three cast their net again, and brought up the statue's head. After cleaning the statue they found that it was Our Lady of the Immaculate Conception. Naming their find Our Lady Aparecida, they wrapped it in cloth and continued to fish; now their nets were full. Born to the nobility, the only child of rich and pious parents. After the death of his parents, Maximilian freed the family slaves and gave away his fortune to the poor. Pilgim to Rome, Italy. Sent as a missionary to Noricum and Pannonia by Pope Saint Sixtus II. First bishop of Lorch, Norucum. After 20 years of work as a missionary bishop, he returned to Celeia where he became a noted preacher. Ordered by secular authorities to prove his loyalty by sacrificing to idols; Maximilian refused. Martyred by order of governor Eulasius. Prince of Hy-Bairrche, Ireland; son of MacDara. Nephew of the famous bard and convert Dubhtach who taught him to sing. Married layman and father of one son, Fiacre, who was later ordained by Saint Patrick. Convert. Widower. Ordained as a missionary bishop for Leinster, Ireland by Saint Patrick. Founded the churches and monasteries of Domnach-Fiech and Sletty. Known for his severe fasts during Lent. Poet; may have been the author of a metrical life of Saint Patrick, in Irish, said to be the earliest biography of the saint. Though he suffered from an unnamed, painful condition in his later years, he continued to travel his region right up to his death. Tradition says that in the early day of the Church, Saint James the Greater was spreading the Gospel in Spain, but making very little progress. He was dejected and questioning his mission. About 44, the Virgin Mary, who was still living in Jerusalem at the time, bi-located and appeared to him in a vision to boost his morale. In it, she was atop a column or pillar, which was being carried by angels. That pillar is believed to be the same one venerated in Zaragoza, Spain today. Miraculous healings reported at the scene. Second of five children born to the poor but pious family of Matías Salcedo and Elena Puchades. Baptized at the age of 2 days. Became a Franciscan Capuchin friar on 21 July 1899, making his perpetual profession on 21 February 1903. Served as beggar of the house im Massamagrell, Spain for 37 years. Known as a simple, quiet, humble, pious brother dedicated to close observance of the Rule of his Order, and a devotion to the Blessed Virgin Mary. Martyred in the Spanish Civil War. When local children found his body the next day, Brother Pacifico was still clutching his small wooden cross in his left hand. Born to the imperial Roman nobility. Soldier. Equerry to emperor Nero. Convert, baptized by Saint Peter the Apostle. 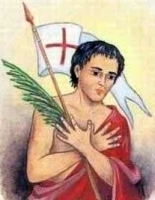 Betrayed by a servant for the crime of being a Christian during the persecutions of Nero, Edisto was captured by soldiers during a covert Mass with four other congregants. Martyr. Son of Castorius; nothing else is known of his early life. Chosen 54th pope at the insistence of Theodoric, king of the Goths. Secured confirmation of the exemption of clerics from civil law, obtained structures for use as churches, and generally used his favored status with Theodoric to benefit the Church. Opposed semi-Pelagianism, writing to settle Church teachings on grace and free will, and approving the work of Saint Caesarius of Arles on the topics. He tried to designate his successor, but civil authorities and many cardinals rebelled at the idea. Arch-deacon of the cathedral of diocese of Pavia, Italy. 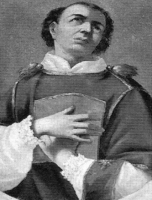 Chosen 53rd bishop of Pavia in 1230 by Pope Gregory IX. Preached crusade against Frederick II, which led to his imprisonment. On his released, he worked to reconcile Frederick with Pope Innocent IV. Noted for his charity, personal penance, worked to provide proper liturgical services in his diocese, and supported the search and enshrinement of the relics of saints. Discalced Carmelite priest. Murdered in the religious persecutions of the Spanish Civil War. Priest in the diocese of Tarnów, Poland. Imprisoned, tortured and martyred in the Nazi persecutions. Knights in the army of Blessed Charlemagne. Fought in the campaign against the Lombards in northern Italy. Martyrs. Priest in the archdiocese of Valencia, Spain. Martyred in the Spanish Civil War. Fifth century bishop in North Africa. In 484, Cyprian, Saint Felix, and 4,964 assorted unnamed parishioners were driven into the Libyan desert by the Arian Vandal King Hunneric. There they were tortured and martyred for their orthodox faith. Their story was recorded by Victor of Utica. Mercedarian friar at the convent of Santa Maria in Guardia de los Prados, Spain. Noted theologian. Miracle worker. Daughter of Count Adelard. Sister of Saint Relindis. Friend of Saint Willibrord of Echternach and Saint Boniface. When the sisters wished to take the veil, their father built them a convent at Maaseyk on the Meuse. Abbess at Maaseyk. Daughter of Count Adelard. Sister of Saint Herlindis. Friend of Saint Willibrord of Echternach and Saint Boniface. When the sisters wished to take the veil, their father built them a convent at Maaseyk on the Meuse. Abbess at Maaseyk. Young Christian woman tortured and martyred in the persecutions of Lysias. Bishop of Milan, Italy for 56 years, serving through many imperial Roman persecutions from 193 until his death. Bishop of Basle, Switzerland. Martyr. Commemoration of the 4,996 martyrs who died in the persecutions of the Vandals in Africa mandated by the Arian king Huneric. The persecuted Christians include bishops, priests, deacons and thousands of the lay faithful.